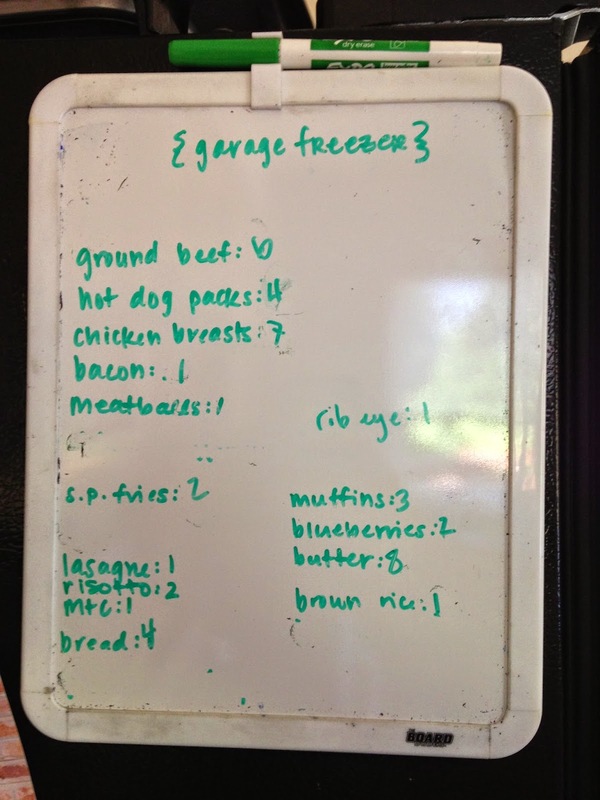 One of the ways I love serving our family is through meal planning. I did not grow up knowing my way very well around a kitchen, so when Kyle and I got married it became very clear to me that I had a lot of learning to do! Fortunately Kyle is not too picky about meals, but I knew this was an area that I really wanted to grow in. Before kid(s), I was able to devote much more time to trying new recipes, and I'm glad I did that. That season helped me to discover some tried and true favorite recipes that I use today. Fast forward to the season of life we are in now: one toddler, one baby on the way, and an extra adult to feed (we are living with my dad). 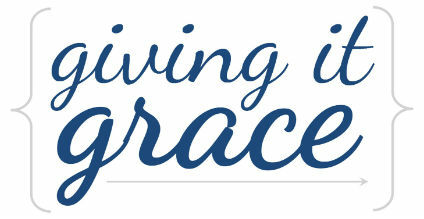 Currently, I don't have as much time or energy to devote to trying recipes, planning meals, shopping, or cooking. As a result, the last six months I've really honed in on a routine that's working really well for us. I wanted to share that routine here, because I think it could be helpful to others. This is true both for meal planning and for grocery shopping. For our weekly rhythm, it makes the most sense for me to do meal planning on Thursdays while Drew is napping. We then head to the store when he wakes up, and everything is fresh in my mind. There was a brief season when I was able to meal plan for two weeks at a time, but that season has passed and I'm back to doing one week at a time. I know some women that can meal plan for one month at a time - I deem that to be really impressive! The weekly store trip I found to be most effective for maximizing the lifespan of produce, as well as easiest on our budget (more on that below). I also make a Costco trip once a month. I was never able to find something that really worked for how my brain wanted to organize meal planning, so I ended up creating my own menu (customized menu available for purchase at the bottom of this post). This menu allows me to do several things that make meal planning easier for me. The Prep column is where I make note of what needs to be prepped that day, if anything. An example would be "set off crock pot in AM" or "thaw beef". The Events column is where I make note of events that effect meal time. For example, if one of the adults wont be at that meal I know to make less food. Or if it's a day I'm going to be out of the house until just before dinner I know to not plan a dinner that requires a lot of cooking time or prep work. The Meals column is where I write out breakfast, lunch, and dinner. 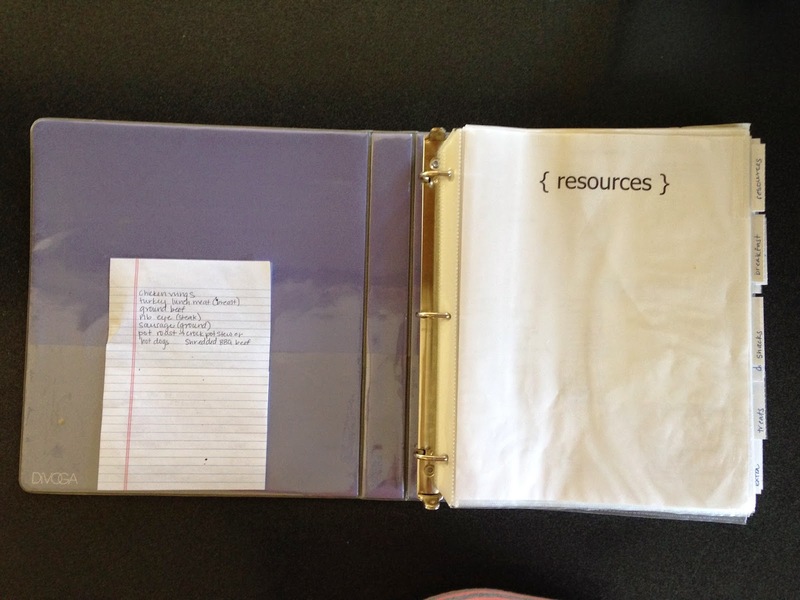 I like having a big space for this in case I have notes about certain meals that take up more room. Once filled out, this hangs on the fridge so the boys can see what we are having for the week. *The breakfast bar is usually something I've made over the weekend. I have several go-to recipes for breakfast bar/cookie/loaf type items that are sugar and gluten free that I rotate between. In a pinch, I pull some Aussie Bites from Costco out of the freezer and nobody complains about that! For lunches, Kyle usually has left overs, sandwiches, or I'll cook him something on Sunday that he can eat all week (thankfully he has no problem eating leftovers!). For my dad, Drew, and I, I keep a variety of lunch foods on hand: sandwich fixings, fruits and veggies, hummus, cheese, etc. For weekend lunches I try to do something light and easy (pinto bean and cheese pockets, rice and bean wraps, pasta salad, meat and cheese platter, etc). I thought that maybe the boys would get tired of the repetition, but they really don't seem to mind. I guess it's something about having your food prepared for you that makes it possible to overlook the routine nature of the meals. I do break from the pattern every few weeks, but I love knowing that I don't have to start from scratch every week. Despite my weekly meal pattern, I still have handful of resources that I use to keep variety within the meals and to help with the actual grocery shopping. 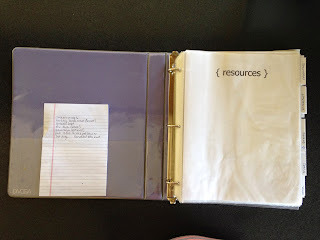 In my Meal Planning Binder I keep: Meal Index, Fruits and Veggies by Season, Dirty Dozen list, a weekly Shopping Checklist, and my printed recipes. Meal Index: this is something I refined over time to be a comprehensive list of meals that make sense for us (based on price point, ease of making, and yummy factor). That's it, these are the meals I make. Perhaps at a later season in life I'll take on new recipes, but for now there is plenty of variety within the meals I do make, and I'm not willing to devote any more brain power to new recipes during this season in life. Fruit and Veggies by Season: I mainly use this when I'm feeling brain dead on which snack or dinner side veggies to pick up. Between Drew, Kyle and my dad, there are a lot of preferences on veggies - mostly negative. Basically the only vegetable they can all agree on in spades is carrots. To remedy that, on my printed copy of this document I went through and put the first name initial after each vegetable that person eats. This helped me get an idea of what vegetables to buy that wont go to waste. Getting fresh vegetables into the boys is something I work the hardest at. I'm usually sneaking them in via smoothies or zucchini bread, but I've also been pushing their taste buds by offering them roasted vegetables 1-2 times a week. It doesn't go over all that well, but no food is inherently gross so I'm hoping that over time their taste buds will adapt. Another thing that has worked is keeping a bin of fresh snack vegetables already washed, peel, chopped, and ready to eat in fridge. 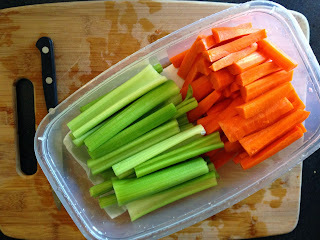 This usually consists of celery and - you guessed it - carrots. Dirty Dozen and Clean Fifteen: I found this list on the internet a while ago, and every so often I check to see if anything has changed (sometimes it does). I keep a copy of this list in my wallet so when I'm at the store I can remember what's worth buying organic or not. Right now, the only produce I buy organic are the ones on the dirty dozen list. That's something Kyle and I have agreed on, considering organic is more expensive than non. Weekly Shopping Checklist: I refer to this to make sure I'm not forgetting the weekly staples. This resources also includes my master Costco list. I've recently started noting the price of the items we buy at Costco so I can make sure I stay within budget when I make our monthly Costco run. Printed recipes: These are recipes I've found on the internet that I don't want to have to look up each time (most of them are saved on my Pinterest board). I've taken the time to print them all out, and they live in my Meal Planning Binder. Other than these recipes, I only have two actual recipe books I use right now: Against All Grain, and Budget Bytes. Pretty standard protocol here: look at the meals for the week, check the fridge, consult the weekly shopping checklist, and make the list! 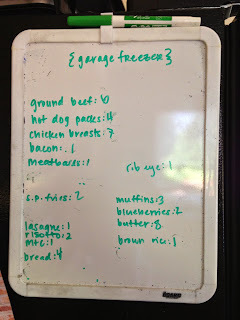 On the side of our fridge upstairs, I keep a whiteboard with an inventory of what's in the garage freezer and then consult that to see if we are running low on any freezer staples. My methods for budgeting hasn't changed since I started meal planning. I take our overall food budget for the month and subtract out the weekly Smith Brothers dairy delivery (the same every week) and the monthly Costco run (I commit to a fixed number for that), and then divide the left over amount by how many Thursdays there are in the month. That number is the weekly budget for groceries. Because of the meal pattern I follow, our weekly grocery bill is essentially the same each week - give or take $20. I used to be all about shopping at Safeway because of their Just 4 You discount program, but over time I felt that they were offering less healthy foods and more discounts on items in the middle of the store (so all the processed stuff). That really peeved me, so I started shopping every other week at Trader Joe's (a longtime favorite store of mine). I buy relatively the same foods every week and was finding that my Safeway bill was consistently $20-$30 more than my Trader Joe's bill. A few months ago, I made the full switch to Trader Joe's and am very happy with this choice. Aside from the bill being less, any product with a Trader Joe's label on it has no artificial flavors or preservatives, synthetic colors, MSG, genetically modified ingredients, or partially hydrogenated oils (artificial trans-fats). 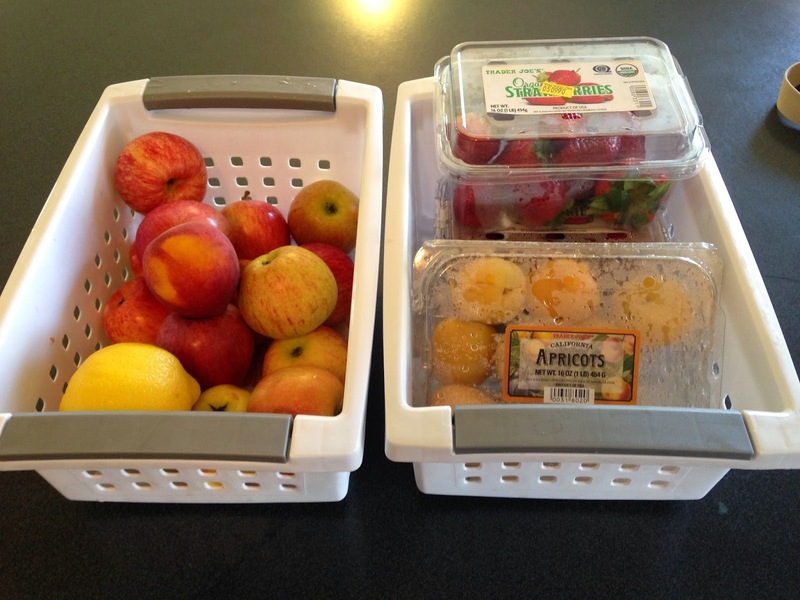 Anything that makes healthy shopping easier for me is a win! This also provides me some relief about "Friday Fun Meals": I can grab some freezer mac n' cheese or a pizza from Trader Joe's and know that it's free of all the additives listed above. As an aside: when I made the switch over to Trader Joe's, we stopped our Full Circle Organic Produce delivery. I'm able to get the organic produce I need at Trader Joe's at a much better price point, so the Full Circle delivery really stopped making any sense for us. PS - I love this grocery list pad from Knock Knock! When I get home from the grocery store, I take maybe 30 minutes to deal with any foods that need to be prepped for the week. The main example of this is snack veggies: I found the boys are nearly 100% more likely to eat veggies for snacks if they are already cut up and ready to eat (before doing this I was throwing away a lot of uneaten veggies each week!). I also recently started buying whole pineapples, as we love pineapple. It takes me an extra 5 minutes to carve the pineapple and then we have fresh pineapple for the week - yum! So why go through all this work just to get food on the table? The main reason is that all-things-kitchen do not come naturally to me; I have about 3 meals that come to mind when I think of making dinner on the fly (mac n' cheese, grilled cheese, and quesadillas - I love cheese...). Our health (and budget) is important to me, and I knew that I had to start being intentional with our meals if I wanted to be a blessing to my family in this way. Before I had all these resources in place, I felt like I was recreating the wheel each week when it came time to meal plan. It was painful for my brain to think of the meals, and it was far from a pleasant experience. Once I narrowed down my list of recipes and set up a weekly pattern, I really started to find joy in the whole process. Once I was finding meal planning joyful, I was then able to really find my groove and continue to add things into my routine without getting overwhelmed. It is such a blessing to be able to find happiness in the seemingly mundane (can I get an 'amen' from the mommas out there?! ), and I want my kids to know that it's possible to be content - and even filled - by doing life's less glamorous tasks. I also want my husband to come home to a happy wife, and taking the chaos out of meal planning has made meal time something I don't have to fret about anymore. If meal planning is something you find tedious, I urge you to figure out what specifically is holding you back and attack that with gusto until it's no longer an obstacle. What works in your house may not work in someone else's house - but that's okay! Like most things, you have to find what makes sense for your family and be confident in that. I hope that these resources are helpful to others. Happy meal planning! If you'd like to use the Weekly Menu I designed, you can purchase your own for $1.00. Be sure to select the day of the week you want your menu to start on. Once I receive your payment, I will send you an e-mail with the Weekly Menu attached in PDF format. The Weekly Menu PDF is for personal use only. Love this, thank you for sharing! Gives me hope. Also have the All Out Of list. It's awesome. Sometimes gives me good ideas of stuff to buy!